* Observer, February 12th, 1928. Indeed the history of killing is the history of the world; and it is therefore hardly surprising to ﬁnd that in nothing has man shown greater ingenuity than in inventing and perfecting methods and machines for killing his fellow man. The present booklet does not pretend to more than touch the fringe of state killing, of which capital punishment is a less important aspect. On this smaller aspect of the bigger subject I have collected what may prove to be useful information. For my own part, having carefully turned my thoughts upon the complex problem which it presents, and maturely weighed the several schemes of Governments for the despatch of criminals, I have reached the conclusion that no people can point to a method which is both more beautiful and more expeditious, or which is aesthetically superior to the time-honoured British practice of breaking their necks by hanging. With us the hangman is like the dog; the friend of man. There is an irony in life that becomes oppressive when we consider how some quite useless people live to be a hundred, while others are killed by impact with a Ford car. When the great chief priest of the people of the Congo fell ill and seemed likely to die, the man who was destined to be his successor entered the pontiff’s house with a rope or a club and strangled or clubbed him to death* which shows how philosophical a race of savages could be about death. An orange-peel carelessly thrown upon the pavement may take from us a great statesman, a great poet, a great painter; or a great public nuisance. An elephant may perish by a ﬂea-bite in the ear. Truly death is fortuitous in so many instances that it seems to be a matter of very small concern how it comes. And the evidence shows that hanging is as effective as any other form. * Frazer’s Golden Bough, IV. page I4. Taking this as a basis it is possible to write calmly on the general subject of state execution. One may consider hanging from various points of view. One may, for example, treat it as one of the ﬁne arts. One may weigh the aesthetics of hanging. One may consider it as sublime; or ridiculous. One may even take hanging as the unit of English morality. And one may delve into the history of hanging. But although it is an ancient practice, bearded and hallowed by its very antiquity, it is not my intention to write an erudite chronicle of suspension, but rather to deal with it as it is to day and to offer suggestions for improving it generally, and thereby to increase its popularity. Where all authors have failed hitherto in their treatment of hanging is that they have never for a moment considered it as a ﬁne art. They have not considered all that goes towards making a good job of it. They have omitted to mention a thousand and one aspects of the subject of interest to the moral philosopher, and also of interest to all who are in any way concerned with hanging, from the hemp-picker who collects the raw material for making the hangman’s rope to the gravedigger who prepares the quick-limed resting-place of the man, woman or infant who is hanged. It is my intention to attempt to remedy these grave omissions and indeed to offer a serious if brief contribution to contemporary thought on the whole subject. Let us begin then by considering hanging as a ﬁne art. We may almost assume that it is a ﬁne art, and not a base mechanical trade. Is not a man an artist who can painlessly and without brutality dispatch another man? There is a certain delicacy about the operation that needs a ready eye, a swift-working brain, cool and calculating, and a cleverness that is only to be found in the realm of the great arts. The architect constructs a great building from a signiﬁcant series of outlines; the musician constructs an entire symphony from a single series of tones; but our hangman by one pull of the lever achieves far more than either. A great American critic has stated that art of the highest or ﬁnest quality involves three things. First, a reproduction of natural phenomena; second, an expression of the thoughts and emotions of the artist; and, third, an embodiment of both these features in an external product, like a symphony, a poem, a painting, a building or a statue. Or a hanging, I would add. It is, of course, true that hanging is, like scenario writing for the ﬁlms, an art in a class by itself. But it is one without the discords of other arts. Large numbers of people are by nature excluded from the sphere of action of the artist, and it is impossible for them to appreciate the aesthetic paradise in which the hangman lives. I confess I ﬁnd some difficulty in conveying an impression of this, just as I should ﬁnd difficulty, though in a lesser degree, in conveying an impression of certain of William Blake’s poems. The beauty of hanging is recognized by its effects on the mind, just as the beauty of a Velasquez painting is recognized in the same way; and we must be content to leave it at that. Benedetto Croce calls art intuition. Who amongst us cannot immediately recognise by intuition that hanging is an art, and the executioner an artist? Hanging has all the characteristics of art: conservatism, the elaboration of an instinctive mode of expression, balance, harmony in effects, rhythm, tone; and effect. There is no need to labour this point unduly, though I may have to refer to it later. But here I should state that the beaux-arts never reveal their full possibilities in a country which is not wealthy, and in which men may not devote their time in a leisurely manner to the pursuit of the beautiful. (I think Plato or Wells — or both — made this clear.) 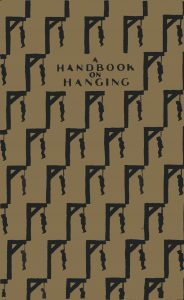 One of the chief reasons Why England is supreme in hanging is because with us hanging has always been regarded rather as a spare-time employment of a cultural nature than as a utilitarian means of livelihood. The ofﬁce of hangman has never yet received its due either in praise or in rewards from the British public. It is not like the post of Public Executioner in the United States of America, where Mr. Elliot hopes soon to “ make his million.” In the United Kingdom there is an average of about 150 cases of murder known to the police every year. Of these only ninety on an average are proceeded against, and in only about twenty-ﬁve are there actual convictions for murder. We execute a mere baker’s dozen of human beings every year. It will be seen from this that, unless the emoluments of the English hangman were very high* or at all events brought with them very substantial perquisites, our public executioner could never hope merely by virtue of his office to become a rich man. Although this may be in the best tradition of the Government Service, you will agree that it is deplorable. And it is all the more deplorable when we compare the delicate art of the hangman with that of the ‘electrocutioner’ or the guillotiner, or the garrotter of other countries less civilized than ourselves. * He is paid £10 for each person he kills; the perquisites are no longer great. What skill is required to turn a switch? What skill is required to twist a garrote? What skill is required to decapitate with the aid of an elaborate engine? I do not include in the same category as these three the German method of beheading with a sword. Thank Heaven there is still some art — or rather science — remaining on the Continent of Europe. The Germans go even further than we do in recognition of their science, for their executioner performs his ceremony in full evening dress, like a violinist playing a symphony to an enraptured audience at the Wigmore Hall; like Smeterlin playing Szymanowski; or any other virtuoso appearing at a public function. Our hangman performs in a lounge suit; or, for all I know, in plus fours. He certainly does not function either in evening dress or even a smoking jacket, though in Scotland he has before now worked in kilts. This shows how casually we English treat the business. But to return to the vexed question of art. Before a man is hanged the hangman has to assume the parts of a mathematician, a scientist, an engineer, and an expert in dynamics. Combined with these he must have the mind of a philosopher and the soul of one who practices art for art’s sake. This must be so, because he is so badly paid that nothing but the subconscious drive, which impels great artists towards their major achievement, could otherwise account for his choice of this greatly underestimated and somewhat unrespected profession. Here I would dwell for a moment upon this aspect of the hangman’s calling. I mean his pay and social status. Owing to the greatly increased cost of living, he has not received from the public that he serves one-hundredth the consideration of which he is worthy. Art is all very well; but the artist must live. Apart altogether from the artistic side of the question, a man must be a brave man to be a hangman. I do not mean physical bravery, but moral. And I do not mean moral bravery in the sense that he need have any qualms or pangs of conscience in regard to hanging anybody; but that a great deal of moral courage is required to face the loathing disrespect and even hatred of an ignorant and inconsiderate public. Not that there are not some people who regard him as what he truly is: a hero and an artist. Fortunately, we are not all depraved, and one is glad to note a recent move to treat the hangman as the image of Sublimity, with reference to the Absolute; though this is probably exaggeration. But I must not wander away from the main thread of the subject. Having measured the man to be hanged, taken his weight, examined the contours of his neck (and felt its muscles), the hangman who has a job of work on hand must next see that his apparatus is in good working order. This may appear a simple matter, but it is not really, as you will learn later. If he omits to oil his lever and bolts and also the hinges of the trap door upon which his subject is to stand, he may easily bungle the whole thing. And this has happened before now. There was one man, a certain John Lee, whom they could not hang; a sort of a sport in the game who refused to succumb either to art or mechanics; either to argument or to persuasion. John Lee is a great ﬁgure in the annals of hanging. He possessed the secret, if not of eternal life, then of prolonged life. He refused to die, and it is necessary to say on behalf of the late Mr. Berry, who officiated at the long-drawn-out hanging process, that he was in every way qualiﬁed to perform the task. To judge from a perusal of his book, Mr. Berry appeared to possess something like ideal mental equipment for the line of work he entered upon. He had a keen eye for tone and a just appreciation of the bearing of his art upon human conduct. He had graduated in the University of wide practical experience and had all the tricks of the art at his ﬁnger tips. But the cruel fact remains. Three times he tried to hang John Lee; and three times he failed. Unhappily no record was kept of what Mr. Berry, the hangman, said or thought when he found that John Lee had bested him. It was a humiliating position for any executioner. One can well imagine him saying the words used in Matthew xxvii, 46. Let us hope that the hangman was adequately paid for the extra work involved in this case. There are few sadder pages in the history of the hangman’s art than this tragic failure. Neither the spirit nor the ﬂesh of the hangman was weak; though it is clear that both the spirit and the ﬂesh of John Lee were strong. I take this opportunity of vindicating the honour of the great State strangler whose services were retained for the despatch of John Lee; and any man who imputes weakness either to the executioner or to the governor of the gaol or to the Warders or to the priest of God, who was paid by a considerate Government to minister to the last spiritual needs of the man to be hanged, will certainly have to answer to me. There was an exaggeration of terseness in Mr. Berry’s style, which was often a great excellence. No flaw or hitch could be discovered in the whole business. John Lee simply won the game, feet down. It has been suggested to me that the failure to deal adequately with John Lee is a proof provided by Providence of his innocence; maybe. I incline rather to attribute it to immunity from hanging developed by heredity in accordance with Mendel’s theory; and I would also submit it as a fact tending to prove the correctness or otherwise of the Darwinian theory of evolution. A sentiment, which, if rather old-fashioned, is not too platitudinous to be cited here. This brings me to the qualiﬁcations of a good hangman. The case of John Lee happened within living memory and is in the nature of proof that not nearly enough care is taken in the selection of hangmen. At present he is appointed by the old and discredited system of patronage. In our ordinary Civil Service this was abolished very many years ago. An open competitive examination now decides who will be our future Civil Servants, and I would suggest that the same method be applied to the office of public hangman. That the competition* would be keen I think there is no doubt. * The late Mr. Berry was one of 1400 applicants. We have recently seen the case of Monsieur Deibler, the French executioner. The Deibler family has been public executioners in France for nearly two hundred years. The office passed on from father to son as a sort of prescriptive right tenable by heredity. With diminishing duties and a depressed franc the Maison Deibler has been on short commons lately, a deplorable state of affairs for which our gallant Ally must receive both our sympathy and our censure. It is even worse than this, for juries in France have reached that stage when they will not convict in crimes passionelles, and the poor executioner is consequently often hard put to make ends meet. It is true that occasionally it is possible to get a peculiarly atrocious murderer condemned to death in France — if by influence, money, strategy, or all three, his friends succeed in keeping his name out of the newspaper headlines. But in all other cases an ingenious, eloquent and emotional lawyer can be sure of getting his client acquitted. Such is the pass to which Justice has come across the Channel. Without going into further details, it may be taken that Monsieur Deibler no longer ﬁnds the fascination in the Work which has so honourably been kept within the family for generations. He has decided to retire and, as he has reached the Civil Service age limit, nothing can stop him. It is, of course, regrettable that a post with so many happy memories attaching to it should now be dissipated to public competition. The lucid artistry of the Deiblers, and the aptness with which they have always performed their function, ﬁnds reﬂected value in their own aesthetic character. Alas! Monsieur Deibler has not been blessed with offspring (perhaps he was bitten by the bug of birth control) or this lamentable state of affairs might have been avoided. I say lamentable merely out of recognition for the great past achievements of the Deibler family; but not to affect the general principle of open competition, which I favour. A competitive examination will be held between the 1st and 14th of August next for the post of Public Hangman in England. The successful candidate will be expected to undergo two years’ probation before deﬁnite appointment. Commencing salary will be at the rate of £400.0s 0d. per annum, plus Civil Service bonus at the current rate. Canvassing of Cabinet Ministers or Members of Parliament will disqualify. Forms of application with Birth Certiﬁcate to be sent in before the 3Ist May. The standard of education will be that of Pass B.A., Durham University; but a knowledge of arithmetic will be expected. The successful candidate must have a high moral character. Women may compete in this examination. Only natural born English subjects need apply. You have to hang Mr. A. He is 5 ft. 10½ in. in height and weighs I2 st. 2 lbs. 6 oz. I dwt. His neck from the Sterno-Cleido-Mastoid to the Sterno-Hyoid measures 6 ¾ ins. The neck isstrong and 17 ins. in diameter. Calculate tothree points of decimals the drop necessary tohang this man thoroughly, without risk of givingpain to onlookers. Also give the diameter andquality of the rope you would employ, in termsof pounds avoirdupois of strain. It is essential that a hangman should be a person of wide culture and sympathies. He ought to be able to take his place in any grade of society. He ought to be capable of being the guide, philosopher and friend of whomsoever he must hang for us. He ought to have “ personality” in the stage sense of the word; be able to “put it across.” It is difficult to say what a hangman ought not to be, except callous. That would be unpardonable and intolerable from the point of view of the British public, H.M. Government, the Christian religion and the daily press. He ought also to have a good working knowledge of anatomy; and a little psychology would do no harm. There is no reason why one human neck should not be as regular as another, but experience has shown that no two are the same; and hence hangmen must move cautiously. Mostly he is a person of great discretion and personal charm whose art produces a unique and charming personality. He ought to have a good practical knowledge of railway travelling so that he could, without loss of time, keep his appointments in different parts of the Kingdom. At a pinch the public hangman ought to be able to drive a motorcar, or an Austin Seven, ride a horse or bicycle; and be a good public speaker. All these things would add to the dignity of his ofﬁce and overcome the ostracism to which it has so unworthily been subjected in the past. Is not the executioner a conceptualist? The Home Ofﬁce ought to (and does, I think) provide him with a full list of Instructions for the performance of his difficult task; and there should always be at least two understudies, fully-qualiﬁed, and not less than six probationers (Henkersknechte), to assist him. Another idea which occurred to me was that a uniform should be devised for the public hangman in England, just as for certain other branches of the King’s services; the Army, Navy and Air Force, for example, which are employed for the killing or maiming of the King’s foreign enemies in time of war. In time the public would grow to love and respect the uniform of the hangman, just as they now love and respect the uniform of other members of His Majesty’s employment. Who does not adore the bright trappings of the Guards or indeed of the gentlemen who stand outside our picture palaces or great hotels? Women would soon learn to “fall for” the public executioner. It has indeed been a very complete mystery both to me and to my friends why no uniform has been given to so exalted a personage as the hangman; especially when one considers all that is meant by the word uniform. This brings me to a matter that may as well be dealt with, before proceeding further. I have often thought that it is a disgrace to our whole system of justice that the judgment in a famous libel case (quoted by the Law Journal of 28th August, 1926) has not been reversed. The facts of the case were somewhat as follows: On the night before an execution at Norwich, a respectable citizen got out at an hotel. So ultra-respectable was this gentleman in appearance that the bystanders took him for His Majesty’s hangman. An onlooker cried aloud in joy, “You are—” and mentioned the hangman’s name. “Not I,” replied the respectable citizen. “Yes, you are,” persisted the ordinary citizen, and with that the mob, either incensed by the respectable citizen’s cheeky attitude or feeling in a mood for a lark, threw the respectable citizen into a duck pond. The victim of this outrage decided in his own mind that the man who ﬁrst took him for the public hangman was responsible. He consulted a lawyer and sued the originator of the assault for damages for slander. There was no doubt of the special damage; but the defence pleaded by way of demurrer that the allegation could not possibly be defamatory. Now this case, like all cases, was tried by a judge, and a judge like every other human being upon this earth has his own private virtues, failings, prejudices, animosities, likes and dislikes, loves, hates, and so forth. Few indeed are the judges who can, at a moment’s notice, suppress their entire personality and become a sort of abstract automaton capable of pouring out judgments that are entirely without bias and without prejudices. For some reason (which I entirely fail to explain) the judge in this particular case rejected the contention of the defence and held that the charge of being a hangman was calculated to bring its victim into hatred, ridicule and contempt, and therefore—if not in fact justiﬁed as true—was undoubtedly actionable as defamation. Thus, it is an extraordinary truth that a Court of Law in Great Britain has badly “let down” one of its most important and praiseworthy auxiliaries. What was really wrong about this case was the entire mentality of the Court. I live in hopes that this handbook will go a long way towards a clariﬁcation, a puriﬁcation and a general rectiﬁcation of such mental malaise. The defence might have been, on the other hand, a little subtler. They could have said, for instance, that instead of it being a libel to call a respectable citizen the public hangman, it was rather a libel upon the hangman to confuse his appearance with that of a respectable citizen. The epithet “ respectable citizen ” is not nearly good enough for so important a personage. It is as though one had called the late Lord Curzon a “respectable citizen ” when the world acknowledges that he was much more. This erroneous judgment must be reversed, though our present hangmen are so modest and retiring by nature that the occurrence is remote of an occasion to justify bringing a case into Court. At the same time, it must be admitted, there remains the feeling that every error has its element of truth. Charles Duff (Enniskillen, N.I., 1894-1966) a talented linguist and travel writer, served in the British Merchant Navy during WWI, trained as a barrister (Gray’s Inn) and was later recruited into the Foreign Office (Special Intelligence Service —MI6). He resigned from SIS and the Foreign Office during the Spanish Civil War/Revolution claiming it was not only solidly supportive of fascism in Spain and elsewhere, it was also prepared to back a similar system in the UK should the appropriate circumstances arise. Albert (Meltzer) knew him through Charlie Lahr (a German anarchist bookseller who escaped to London to avoid conscription into the Kaiser’s army and who remained there, selling second-hand and antiquarian books, for the rest of his life), whose Bloomsbury libertarian socialist bookshop both Albert and Charles regularly frequented (Charlie later moved the bookshop to basement premises in King’s Cross which is where I knew him years later). According to Albert, Donovan Pedelty (author of ‘The Great Deception’) and his close friend the German-Scottish anarchist John Olday, who knew him in the 1940s and ’50s, Charles Duff described himself as an anarchist.